Is that a hurricane forming? Or is it a GAC? Do hurricanes even forum that far north? At 32 km/h (20 miles/hr) it doesn't seem too powerful. I saw but didn't link to something like 80 km/h edge of hurricane strength. It'll be a little choppy - not sailboat weather - but, without any ice in the vicinity, it seems pretty harmless. The strongest typhoon this year. A piece of the United States has been dramatically wiped off the map after an island in Hawaii was washed away by a powerful hurricane. East Island, a remote spit of gravel and sand that sat atop a coral reef, has vanished after having this misfortune to come into contact with Hurricane Walaka, an intense storm that surged past Hawaii earlier this month. Scientists have confirmed the disappearance of the 11-acre island after comparing satellite images of the surrounding French Frigate Shoals, part of an enormous protected marine area in the north-western Hawaiian Islands. Pressure decreased below 900 mb near the Mariana Islands. 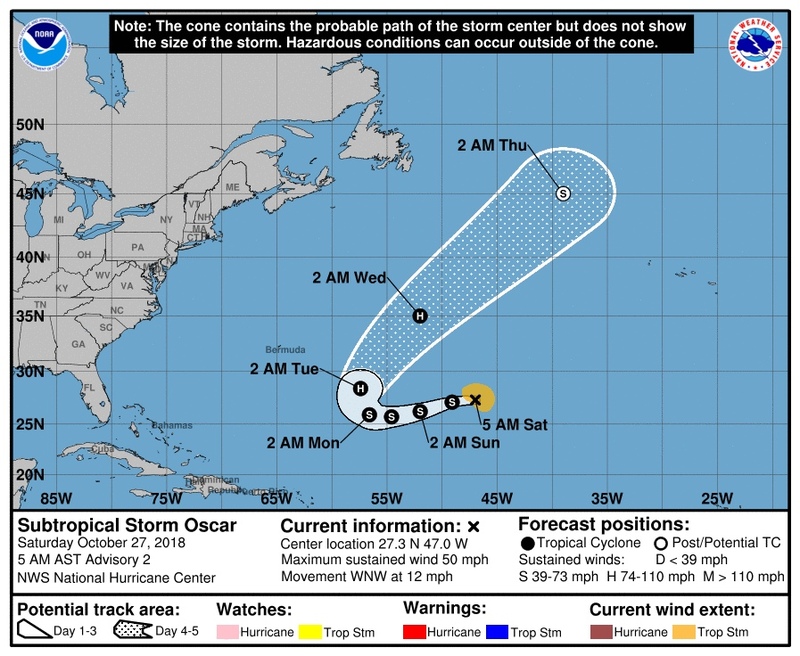 Seventh subtropical storm appears in the Atlantic basin. Looks like Yutu will hit the Philippines much further south than Mankhut. ”Yutu is the fifth Category 4 or 5 tropical cyclone to make landfall in the past 15 months on U.S. soil. No previous decade has had more than four such strikes on American shorelines, making this an outbreak unseen in nearly 170 years of recorded weather history. Super Typhoon Yutu struck the Northern Mariana Islands on October 24, packing maximum sustained winds of 180 miles per hour and gusts higher than 200 mph. This made it the most intense storm to strike U.S. soil since at least 1935, and one of the strongest storms ever measured on Earth. At one point, the eye of Super Typhoon Yutu completely engulfed Tinian. Meteorologists are combing through the debris for clues as to how high the winds actually got, since no anemometer survived the onslaught to provide accurate readings. Hurricane season still has about a month left to go, but it's already been memorable for several unusual reasons. NHC indicates high chance of development now with tropical wave as it moves north of the Caribbean islands this coming week. << Still thinking it will turn? MS: Yes - only concerns I see would be shipping and cruise interests. Will discuss in detail during my video post tomorrow. The computer simulation on the left shows the rainfall intensity of Hurricane Maria under actual conditions. The other images show how much anthropogenic warming already has impacted rainfall intensity (middle) and its projected impact in a warmer climate (RCP8.5). Green areas indicate heavier rain while brown areas mean less rain. ... They found that rainfall could increase 15 to 35 percent in the future scenarios. Wind speeds increased by as much as 25 knots, although most hurricanes saw increases of 10 to 15 knots. "The fact that almost all of the 15 tropical cyclones responded in a similar way gives confidence in the results," Patricola said. The study, "Anthropogenic Influences on Major Tropical Cyclone Events," will be published November 15 in the journal Nature. Storm Gaja leaped over India into the Arabian Sea. With 6 cyclonic storms, 2018 North Indian season is the most active since 1998. Changes to the uppermost layer of Earth's oceans due to rising temperatures are likely causing an increase in intense Pacific Ocean typhoons, suggesting strong typhoons may occur more frequently than scientists project in the coming decades, according to new research. ... A new study published in Earth's Future, a journal of the American Geophysical Union, finds the ocean mixed layer deepened along tropical cyclone tracks by 1.7–2.0 meters from 2002-2015, while other factors changed only marginally. The authors conclude this deepening could be responsible for the uptick in intense typhoons from 1980 to 2015, and they project the increase of intense typhoons will continue at a greater rate than previously projected in the coming decades. Open Access: Liguang Wu et al. Dominant Role of the Ocean Mixed Layer Depth in the Increased Proportion of Intense Typhoons During 1980-2015, Earth's Future (2018). Over the past decade extensive studies have been undertaken to understand the increasing trend in the proportion of intense tropical cyclones (categories 4 and 5 on the Saffir‐Simpson scale). The trend has been found globally and in some individual basins since the late 1970s. This study quantifies the contributions of various factors that control the proportion of intense typhoons. It is demonstrated that the increase of the proportion of intense typhoons during 1980–2015 is consistent with the corresponding changes in the ocean/atmosphere environment. The proportion change resulted from the temporal variations of the environmental parameters (sea surface temperature, ocean mixed layer depth, outflow temperature, and vertical wind shear), as well as the shifts of tropical cyclone prevailing tracks. 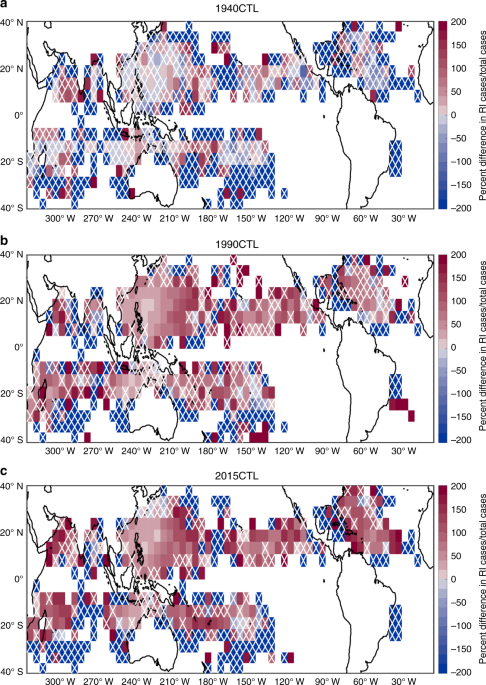 The nonuniform spatial distribution of environmental parameters makes the shifts of tropical cyclone prevailing tracks contribute at least half the increase of the proportion of intense typhoons. The deepening of the ocean mixed layer resulting from the temporal variations and track shifts plays a dominant role in the observed increase of the proportion of intense typhoons. Although the maximum potential intensity theory and numerical modeling project an increase of tropical cyclone intensity in a warming climate, the effects of the temporal change of the ocean mixed layer depth and the prevailing track change were not taken into account in the projection. This study suggests that the increase of the proportion of intense typhoons in the western North Pacific basin could be larger than the projection in previous studies. The increasing trend in the proportion of intense tropical cyclones (categories 4 and 5 on the Saffir‐Simpson scale) has been found globally and in some individual basins since the late 1970s. Although extensive studies have been undertaken over the past decade, its attribution still is a subject of controversy. This study quantifies the contributions of various factors that control the proportion of intense typhoons in the western North Pacific and found that the increase of the proportion of intense typhoons during 1980–2015 is consistent with the corresponding changes in the ocean/atmosphere environment. The proportion change resulted from the temporal variations of the environmental parameters (sea surface temperature, ocean mixed layer depth, outflow temperature, and vertical wind shear), as well as the shifts of tropical cyclone prevailing tracks. The deepening of the ocean mixed layer resulting from the temporal variations and track shifts plays a dominant role in the observed increase of the proportion of intense typhoons. This study suggests that the tropical cyclone intensification could be larger than the projection since the change of the ocean mixed layer was not taken into account in previous studies. Houston_First won’t recover from the economic hit of Hurricane Harvey until well into the next decade. And that's if it doesn't get slammed again in the interim. Puerto Rico's recovery from Maria. More about cyclones in the Southern Hemisphere now. The strongest cyclone in South-West Indian Ocean since 2015/2016 season. Hurricane Maria hit the island of Puerto Rico on 20 September 2017 and triggered more than 40,000 landslides in at least three-fourths of Puerto Rico's 78 municipalities. In a new article from GSA Today, authors Erin Bessette-Kirton and colleagues write that "the number of landslides that occurred during this event was two orders of magnitude (100 fold) greater than those reported from previous hurricanes." Didn't the Permian-Triassic extinction event have something similar to this? Different cause, but similar erosion. 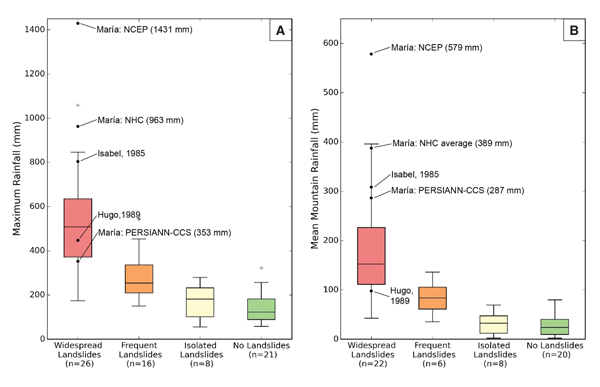 Organic geochemical analyses of sedimentary organic matter from a marine Permian-Triassic transition sequence in northeastern Italy reveal a significant influx of land-derived diagenetic products of polysaccharides. This unique event reflects massive soil erosion resulting from destruction of land vegetation due to volcanogenic disturbance of atmospheric chemistry. The excessive supply of soil materials to the oceans provides a direct link between terrestrial and marine ecological crises, suggesting that ecosystem collapse on land could have contributed to the end-Permian marine extinctions. ... When erosion seven times the normal rate sent large flows of nutrients into the ocean, it created conditions much like the over-fertilization we see today near the outlets of large rivers. As it does today, this condition led to a microbial feeding frenzy and the removal of oxygen -- and life -- from the late Permian ocean. "If there is a lesson to all this," Algeo said, "it is a reminder that things can get out of whack pretty quickly and pretty seriously. We are used to a stable world, but it may not always be so stable." ... Hurricane Michael's damage to the agriculture industry came a year after Hurricane Irma ravaged citrus growers in many areas of the state. But Shannon Shepp, executive director of the Florida Department of Citrus, told the Senate committee Monday that 'the worst is over' for citrus growers. The study, published in Nature Communications, describes its conclusion in blunt language, finding that the Atlantic already has seen “highly unusual” changes in rapid hurricane intensification, compared to what models would predict from natural swings in the climate. That led researchers to conclude that climate change played a significant role. US Federal Emergency Management Agency (FEMA) chief Brock Long has announced his resignation, the latest senior name to leave the Donald Trump administration. And again the african east coast, a little further north. Accumulated rainfall for the next 10 days, up to 700 mm. ... Cyclone Kenneth is chugging from the Pacific toward Mozambique. Currently the equivalent of a tropical storm with sustained winds of about 52 mph, the cyclone is expected to strengthen in the coming days. 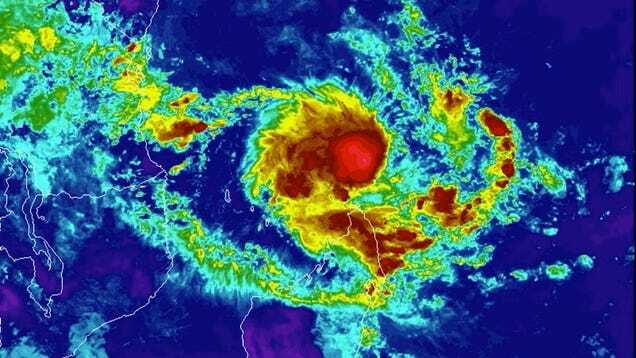 Cyclone Kenneth is forecast to strafe the island nation of Comoros before plowing into Mozambique’s northern coast on Thursday or early Friday. The island archipelago of Comoros could actually bear the worst impacts of Kenneth, wind-wise. The storm is expected to top out at 103 mph—the equivalent of a Category 2 storm—early on Thursday as it hits Comoros’ main island. That would make it the first hurricane-force storm in recorded history to make landfall in Comoros, according to data kept by the National Oceanic and Atmospheric Administration. The 3,000-foot escarpments on the northern end of the island could help weaken Kenneth a bit before the storm strike Mozambique later that day as a strong Category 1 with winds of up to 92 mph ... But that’s where the marginally good news comparisons end. There are a number of population centers still in this storm’s path according, to the Joint Typhoon Warning Center’s forecast. They include Pemba, a city of roughly 200,000, and Palma, a small town that’s a hub of liquified natural gas exports. As with Idai, rain is also a major concern. The storm is expected to slowly move inland, a recipe for copious rain and flooding. Up to 20 inches of rain could fall according to Bloomberg, totals that are worrisomely in line with Idai’s forecast. This topic is about 2018. Hurricane Season 2019.